The role of the CMO is more complex than ever before, and the battle to win over the customer can appear daunting. With over 120 digital marketing channels to choose from, and more than 2,400 products available to manage them, it is inevitable that marketing technology takes a driving seat. More technology means the CMO has now set up camp in the CIO's territory. But this doesn't have to lead to the next office battleground (we all remember the Great Sales & Marketing Wars of the '90s, right? ); there is a way forward. 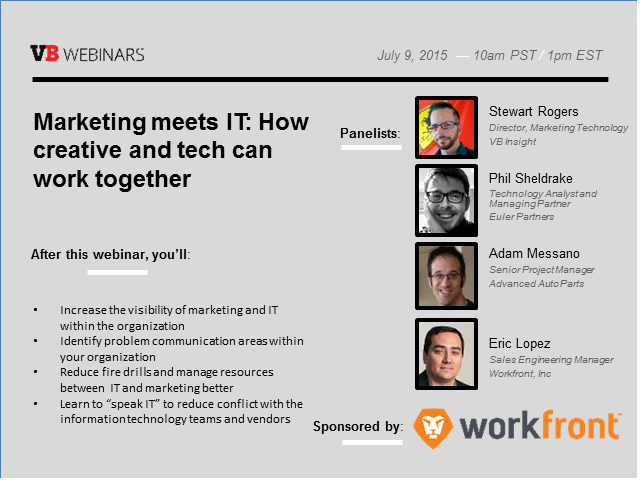 We'll explain how marketing and IT executives can make cross-functional, cross-methodology teams work, without fisticuffs. We'll cover best practices to reduce fire drills, manage resources, and drive productivity. Those siloes that are in the way? Look out because we're going to bust 'em. Like peanut butter and chocolate, the CMO and CIO can work together to deliver awesome, tasty, results - we'll show you how that begins. Eric Lopez, sales engineering manager; Workfront Inc.